Now with stuff you'd never see in cinemas! Over 27 new minutes of footage including new stunts, gags, pranks and general torture of the Jackass gang has been added to their first big screen outing. 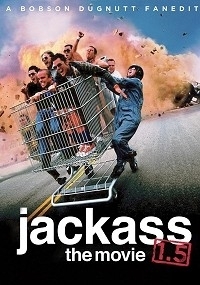 I found a DVD on the side of the road and it happened to be Jackass: The Movie. I decided to watch it and enjoyed it beacuse I am a dumb teenager. It had 27 minutes of deleted material, so I just added it all back in throughout the film for a longer experience.